About a month ago we (my family) planned to take a trip out to Florida to visit family and then we would leave Andrew with my mother-in-law for 9 days to give me a break. I was dreaming about the time I would have. Nine days is not a lot of time but it was enough time to just take it easy, not have to worry about changing diapers, making lunch, scheduling naps, playing when I don’t feel like it. It was enough time to enjoy not having to fight a toddler when things don’t go his way or not have to hear whining and even be able to cook a meal and eat it in peace. It was just enough time to be able to really work on my blog, uninterrupted, and maybe even take myself to a cafe once or twice and enjoy a nice quiet atmosphere (and maybe a cool tea to go with it). Yes. I was definitely dreaming for those nine days to come. Andrew had really been a hellion and had been testing my every bit of strength and patience. Each day was a battle to get through the day and I was SO ready to pass him off for a week and half (go ahead, judge me!). To top it off we both caught a cold a few weeks prior to our vacation. The week before we left Andrew got over his almost completely but I was still battling a serious sinus infection. Let’s just say those nine days were not coming quickly enough!!! We spent a nice, busy week in Florida visiting with friends and family and when it was time to say goodbye for 9 days to my toddler, I felt a little pain in my heart but I knew he would be happy and busy and so would I. My husband Scott and I arrived in San Francisco at about 8:30pm on Wednesday, April 27 and I was so excited to start our mini vacation. I was so excited for me time. We received a text when we got off the plane from my mother-in-law (MIL) saying that Andrew had a low grade fever. Fevers do not really scare me because they are a good sign that the child is fighting whatever is going on so I wasn’t too worried about it. I figured he may have just missed us and that’s what got his fever up. I wish I could say that is what it was but it wasn’t. His fever got progressively worse and by Friday he had a full blown 105 fever. At this point my MIL was starting to get a bit panicky (I don’t blame her) because of the high temperature, loss of appetite and the occasional eye “rolling” because of how sick he was. I was apprehensive about telling her to give him ibuprofen but at this point it was out of my hands and I wanted to make sure she didn’t have a complete breakdown due to the stress of caring for her grandson (with his parents 2800 miles away). Saturday morning she called me and told me that he wasn’t sleeping well at night, was starting to pull at his ears and every time she tried to put him down for a nap he would cry in pain. She wasn’t sure but suspected he may have an ear infection. He would not eat anything but luckily he drank tons of water (throughout the whole sickness). By Tuesday I was on a plane, heading back to FL to take care of my sick baby. Of course, the day I flew in his fever dropped significantly and he was starting to eat but it was better I was there. Every baby needs his mama when they don’t feel good. My MIL was able to get with a holistic pediatrician that same day and he gave us a few supplements and a regimen to follow. Below I’ll outline what he gave us and why it helped heal Andrew’s ear infection. You can also click here for a list of dosages of the following recommended by the very same doctor I saw. Please keep in mind I am not a licensed medical professional. What I do is purely for research and/or personal/family use. I cannot be held responsible for improper use. Always seek advice from a medical professional if you have doubts. These claims have not been approved by the FDA. Larix is the water soluble, long branched arabinogalactan (AG) that contains prebiotic properties (feeds good flora in the gut). AG is a fermentable fiber found in the Western Larch Tree and it is also the active constituent of echinacea. And actually, Larix has been found to be more potent than echinacea in small amounts. At first, I ordered HerbPharm’s Garlic and Mullein Oil ear drop blend to use but the pediatrician recommended Gaia Kids Ear Drops instead. Why? Well, unlike HerbPharm’s brand, Gaia Kids contains a few other medicinal herbs as well which gave it a more healing power punch. Besides garlic, olive oil and mullein oil, Gaia Kids Ear Drops contains St. John’s wort flower bud, goldenseal root extract, lobelia herb and seed extract. Check out the benefits listed below. 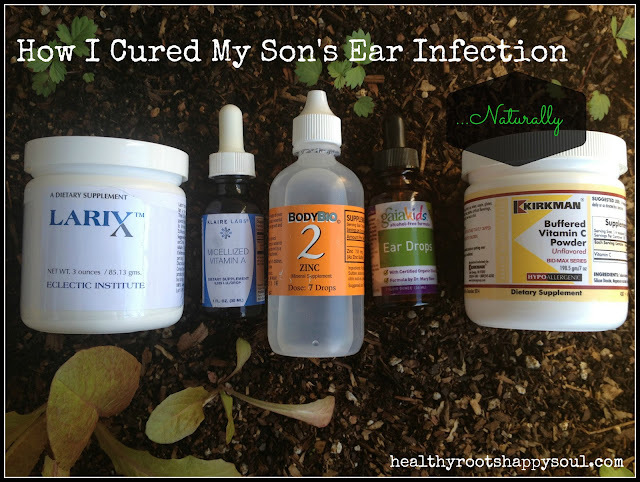 As a note: Although we ended up using this as the treatment for Andrew’s ear infection I believe if we would have used HerbPharm’s compound at first sign of the infection, it would have healed his ears before it escalated into a full blown infection. You can buy Gaia Kids Ear Drops by clicking here. However, he only had Andrew on the vitamin A drops for about 3x a day for 3 days (5 drops) because it is very strong and can damage the liver if used excessively. You can find the brand I used by clicking here. Zinc was also given as part of the immune building regimen. Zinc is a mineral that our body can not store which is why we need daily intakes of the right amount to keep our immune system healthy. It is also responsible for maintaining mood, mental clarity and restorative sleep, prostate and intestinal health and sustaining the sense of taste and smell. Too much zinc could actually do the opposite by weakening your immune system and depleting your body’s store of copper and good cholesterol. That’s why balance is everything! You can find the brand of zinc I used by clicking here. The last thing we were given was Buffered vitamin C. Buffered Vitamin C is a combination of vitamin C, calcium, magnesium and some form of potassium (and sometimes sodium). Companies use the conjunction of minerals with vitamin C so that the acidity of the vitamin C does not disrupt people’s digestive systems. This is because the minerals help balance the pH and neutralizes it so it breaks down slowly and is easier to digest. You can find the brand of buffered vitamin C I used by clicking here. The whole healing process took 3 weeks to completely rid Andrew of his ear infection but we did it! We cured his double ear infection without the use of antibiotics despite two doctors telling me there was no possible way it was happening naturally. Although at times it felt like the forces were against me I kept faith that I could heal him and I did. Next time a doctor tells you that you have to use antibiotics look to more resources. Research and try everything you can to heal naturally. Herbs were created on this planet with healing properties for a reason! It’s just about finding the right combination. Three cheers to natural remedies! You know, my son was really sick for 5 days before we put him on any immune building supplements. However, once we did, it seemed like within 4-6 days he was starting to hold his ear less. Within the first two days of treatment, his appetite came back as well. Nice read! Tinnitus is a common ear problem which can cause hearing loss if not treated at right time. To minimize the effects of tinnitus it is essential to avoid exposure to loud noises, such as music, power tools, and industrial machinery. The main cause of tinnitus is loud volume so if you cannot avoid loud noises you should start to wear best Hidden Hearing aids. Wearing hearing aids can improve your hearing. i am miss Florence from USA, i navel believe that hiv cure is real on till i got in contact with Dr wonder, my HIV stated eight years ago, i was even waiting for death because all my money went out for drug, which keep me till today, one day i saw in the interment that HIV cure is out i then email Dr wonder, and he prepare the herb for me which i took, after taking it he told me to go to the hospital which i did, could you believe that i was confirm HIV negative after the test, and i went to another hospital and it was also negative. if you have this problem and you want to be free from it please contact this doctor with this email address drwonderhealersolutiontemple@gmail.com, he is the best HIV cure you will find in the whole world. thank you Dr wonder am free now.